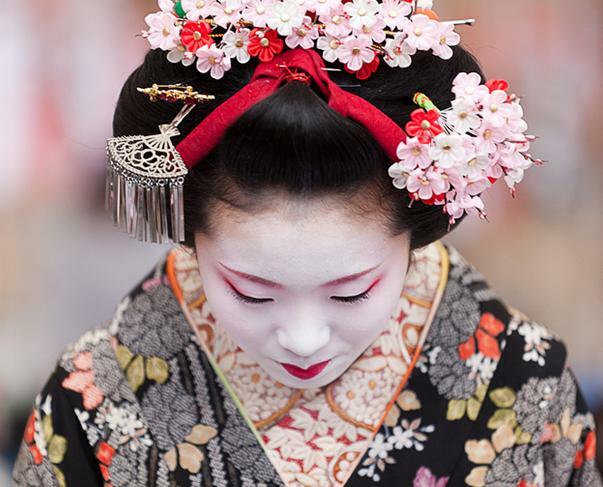 What do you think of when you hear “maiko”? “Darari-obi” (long sash), “okobo” (wooden sandals with thick soles), and “ohikizuri” kimono with trailing hem. Their left hands always hold “tsuma” (the hem of kimono) when they walk outside. Their hair is set in traditional Japanese style. Flower hairpins swing on the hair. Their kimono shows the season. Their costumes change with every month and also express the transition of seasons. It is a wonderful style to welcome guests. 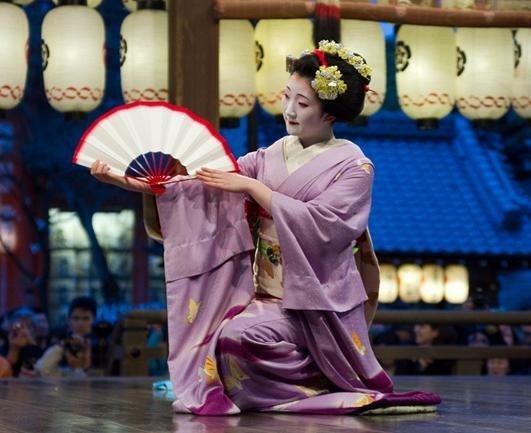 This hospitality is part of the maiko’s tradition. Hairpins are decorated with auspicious motives such as hagoita paddles or pine, bamboo, and plum trees. A dove and rice ears also adorn the hairpin and celebrate a happy new year. The patterns of kimono also express an auspicious atmosphere. It is said that if the eyes of the dove are painted by the person whom you like, your dream comes true. It is also said that if you get the rice grain from a hairpin of maiko, you will have happy days for a year. There are many famous places to admire plum flowers in Kyoto. Hairpins and kimono show beautiful plum flowers. 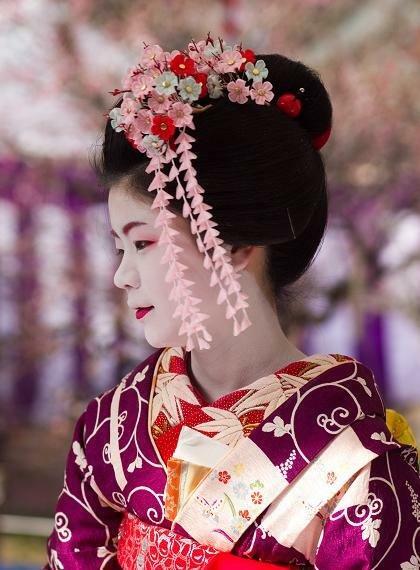 Maiko looks more gorgeous with small red and white plum flowers. They are of an auspicious motif. hairdo and disguise “the monster” at some hanamachi. It is a funny event. 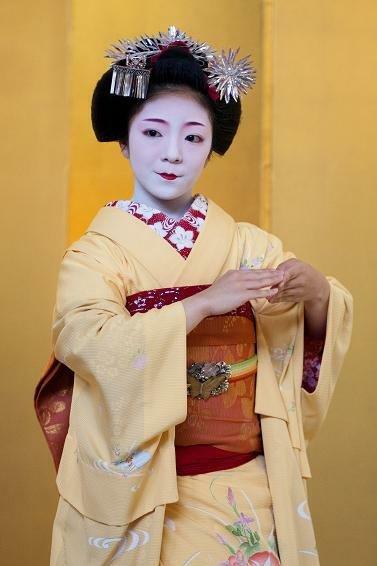 Many maiko prefer the hairpin of safflower, which is known as the spring flower. 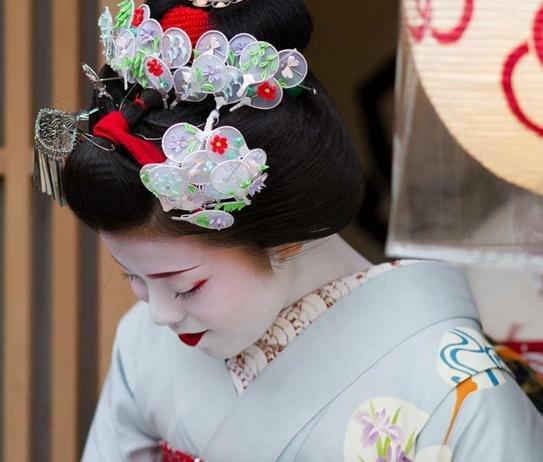 It is still cold in Kyoto but the yellow hairpin on maiko’s black hair tells the advent of spring. Maiko wear kimono of a flying butterfly pattern. It also uplifts the mood of spring. Some senior maiko prefer wearing a hairpin of peach flower. 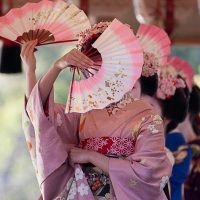 With the arrival of cherry blossoms, each hanamachi holds a spring dance festival. Kyoto is full of spring atmosphere. Maiko wear the hairpin of cherry blossoms but there are many kinds. Other than cherry blossoms, flying butterflies are sometimes put on. 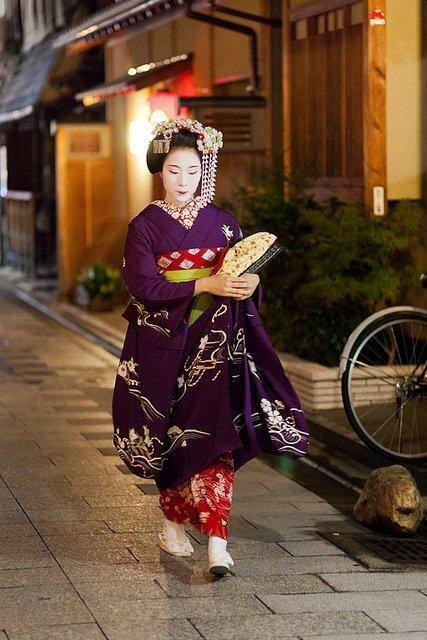 For cherry blossom viewing at night, maiko wear bright colored kimono. They look more beautiful in illumination. Pale purple wisteria flowers tell the change of the season after cherry blossom. wisteria hairpins that swing with the wind. 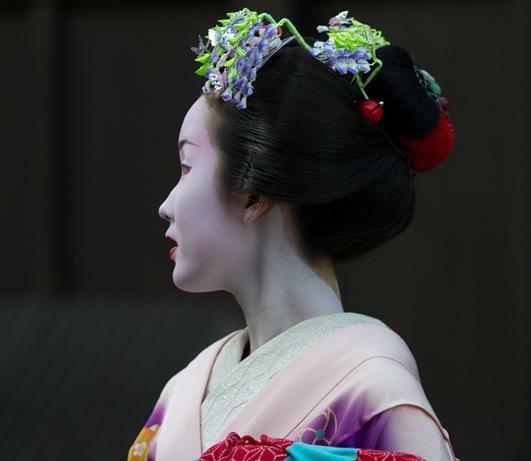 Some maiko prefer conservative hairpins such as a flower of iris. Rainy season comes to Kyoto. Maiko wear hairpins of willow. The bright green color shines in drizzling rain. It is a rare case of a leaf motif because hairpins are usually designed based on flowers. Dianthus flowers are placed along with green leaves. The hairpin doesn’t look gorgeous but gentle. Patterns of kimono gradually change to look cool. Entering July, Kyoto is full of the atmosphere of the Gion Festival. Maiko’s hair is adorned with small fans. They are refreshing and warm up the festival mood. festival. 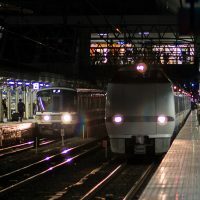 It is decorated with colorful hairpins. We see special patterns of kimono that are allowed for some days during the festival, for example float patterns. The festival season is expressed by the kimono, too. Hairpins express Japanese plume grass. They shine silverly on black hair. Some younger maiko wear pink color ones. A big summer flower, for example morning glory, is used as well. 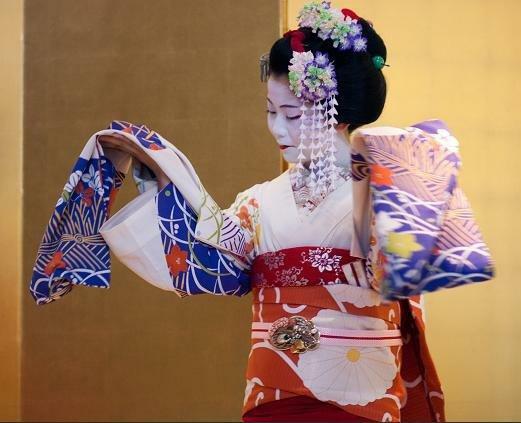 In regards to the kimono, many maiko choose fashionable Daimonji patterns or summer flowers that show the season. 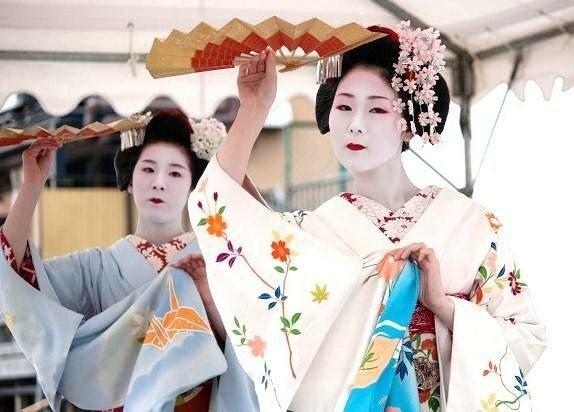 But later in August, some maiko wear autumn flower pattern kimono. Transient of the season is expressed. It is still hot in Kyoto. But hanamachi is decorated with bellflower hairpins. Bellflower is one of the seven herbs of autumn. It seems like that the breeze of autumn has arrived to hanamachi one step earlier. Autumn flowers are usually chosen as kimono patterns. Refreshing autumn is expressed by bright colored kimono. An autumn dance festival is held at each hanamachi. People feel the arrival of autumn. 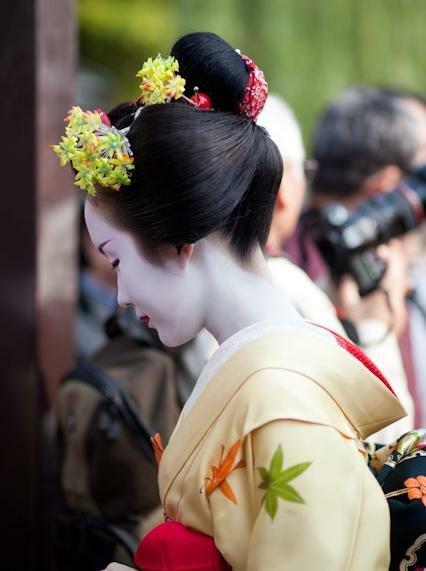 Maiko’s black hair is decorated by various kinds of chrysanthemum. Some are small flowers with tassel. Some are big and very fine. They are almost art work. Maiko wear conservative color kimono. When people see it, they feel the autumn of Kyoto. It is the season of autumn leaves. People of Kyoto appreciate the beautiful autumn color. Hairpins express colors of each season. For example, plum flower’s red and white or safflower’s yellow and white. In this season, the red of maple leaves and the yellow of gingko leaves show autumn color. Kimono often have a maple pattern along with hairpins. They decorate the autumn of Kyoto. It’s not too much to say that the December of hanamachi starts with the all-star appearances at Minamiza Theater. Male role actors write black letters. Female role actors write red letters. Some maiko change maneki every time going to the theater and ask many actors to write their names. A year of hanamachi moves with the transition of seasons. 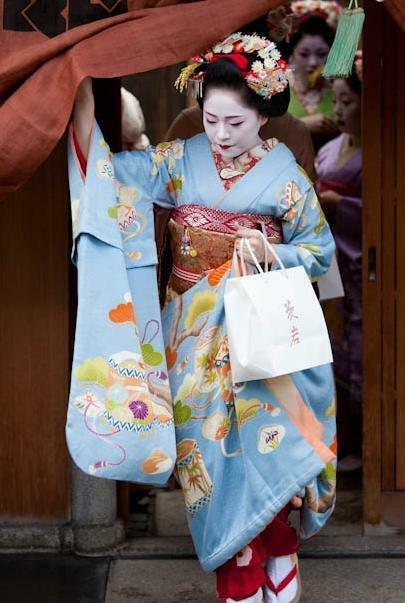 Maiko briskly walk on the street of hanamachi but the outfit weighs twenty kilograms. Craftsmen’s skills that have been handed down over generations. 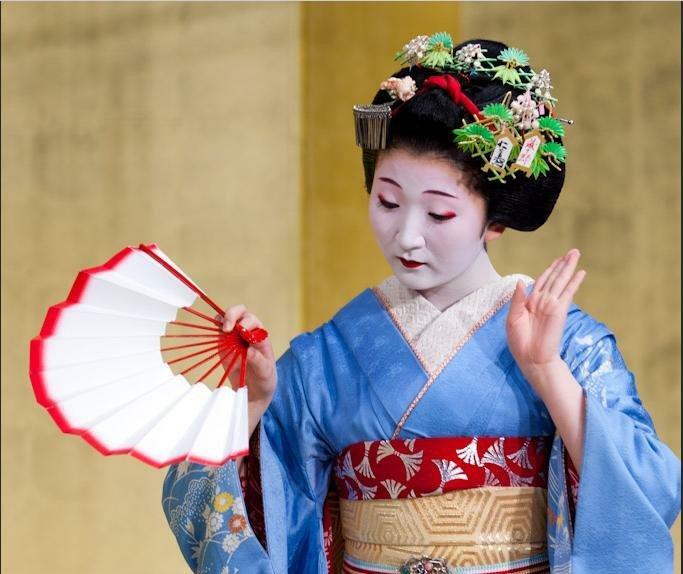 Maiko’s skills that have been grown by daily practice. 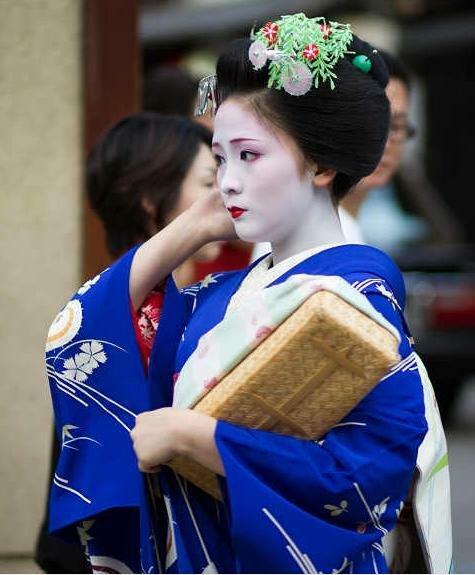 When these two elements are combined together, we see elegant maiko on the street. It is the landscape of hanamachi which has not changed since older days.